We warmly welcome you to the new Emed website and fresh look newsletter. After a few hiccups last week, we are pleased to announce the new website is up and running. If you need help navigating around the site, take the opportunity to Live Chat to one of the Emed Practitioners available during business hours. Log in and check out the new features, we would love to hear your feedback. This new site will not only help you improve your health but has the potential to change the way you access medical information and interact with your health care professionals. The exciting new site has been built from the ground up with a fresh new look and user friendly search features. Emed is updated with the latest health news, as well as the best health products and natural medicines available in Australia. We have spent many months planning and developing a system that would be easy for our patients to use. We have literally built this from the ground up. It is a completely new platform (WordPress if you’re interested). This has given us the ability to add technologies and nifty plug ins that will enhance your experience and make things easier. But please bear with us as we are still developing new systems and special features. The biggest upgrade is to the store. We have made shopping easier and quicker. We are using eWay as the payment gateway so you can process Visa, Mastercard (and Amex coming soon) right on the site. Paypal is still an option if you prefer. There have been a lot of new developments within the online practice, and on the eClinic. In fact the eClinic is now busier than ever. There is a lot of new FREE stuff on website that is of great value, including Free eBooks, nutritional tips and rehabilitation protocols all available in the Patient Resources Section. Also, when you visit the site during business hours, you will be able to live chat with a health care professional. This is a great new feature to help you achieve what you need in the shortest amount of time. I would encourage you to join the online clinic community. Like us on Emed Facebook page. 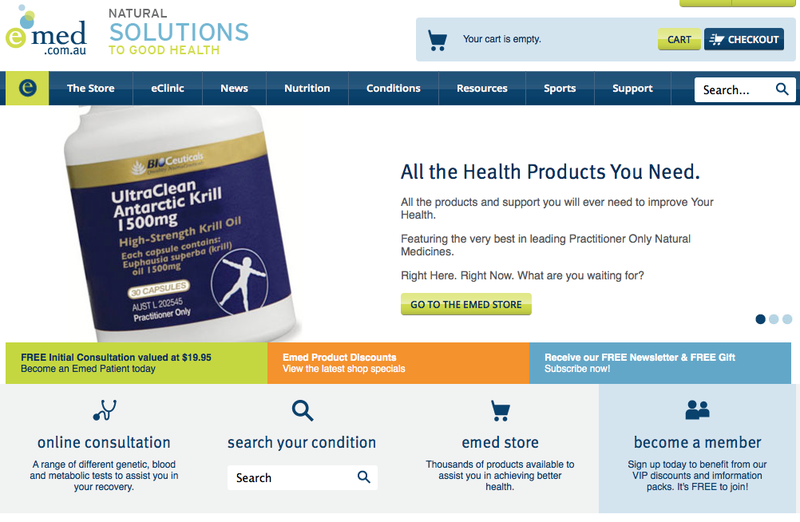 Use the website as a valuable resource to help you achieve better health.